Visiting wineries is always a tricky proposition as shown by any of our guides where we feel like we could always have used an extra week to dig up just a scratch more information. Of course, those are typically in uncharted waters. For our recent trip through the Willamette Valley in Oregon there is a very nice map and we have had a good deal of exposure to the wines from this area prior to arrival. We were first introduced to Owen Roe wines at a restaurant in San Francisco when presented with the “Sharecropper’s” for a meal. Intrigued by these bottles with the dual personality of being both Oregon and Washington wines, we were mightily impressed. After seeking out other vintages such as the “Sinister Hand“, “Abbott’s Table“, and “Ex Umbris” we most definitely became fans. 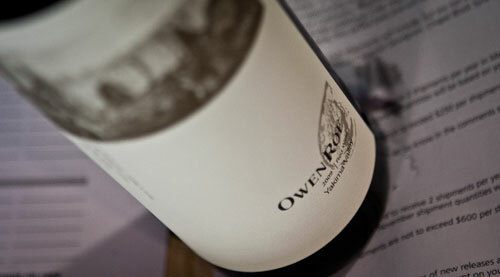 Thus, when up in Oregon, we made sure that our first stop on our whirlwind tour was the Owen Roe winery. The winery itself is more of a processing and aging facility. There are no bucolic rolling hills of vineyards; just barrels and bottles. They don’t even have a tasting room, so tastings are an impromptu session sipping a few wines amongst their main barrel staging area while winemakers clamor around taking care of topping off. Naturally, due to the lack of fluffery, this means that you get right in to tasting David O’Reilly’s wines starting with the 2010 Pinot Gris that presents lemon and other citrus aromas to the nose. There is a small touch of oak from the neutral barrels that it’s aged in, but otherwise it comes out clean due to the majority of stainless aging it receives. From there we moved to the 2009 Pinot Noir which is from the Red Hills of Dundee just down the road from Owen Roe. It’s a light wine, but has a prominent smoky aspect to it that comes from aging in small, new oak barrels. We closed with the 2008 Rosa Mystica which is made of Cabernet Franc from Yakima Valley in neighboring Washington. While generally not a huge fan of West Coast Cab Francs, this one was quite enjoyable. Strong red berry tones comes out of it and the oak in the nose is well-defined but not overpowering. Needless to say we walked out with a number of all these bottles which have great labels such as the rather freaky optical illusion you see below. We had noticed this oddity of a winery when looking through the map. They were odd in that they made wines from New Zealand grapes as well as a number of other grapes including 110 year-old vines from Columbia Valley. We were somewhat interested, but decided that we definitely had to stop there when the staff at Owen Roe mentioned that David O’Reilly had originally worked to start co-found that winery in 1994. While Sineann officially requires an appointment for tasting, they were generous enough to let us have a tasting despite just dropping in. 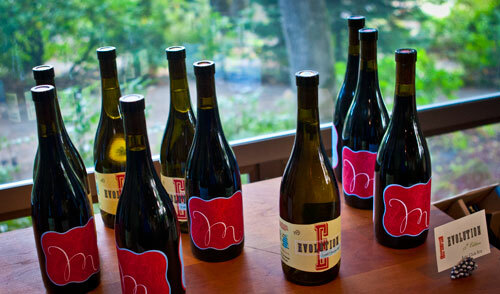 Winemaker Peter Rosback’s daughter Sydney took us through a huge swath of their offer. Everything ranged from good to amazing but there were some stand-outs. One was the 2010 Pinot Noir Resonance. It’s a delicate and refined wine with light oak to the body, albeit it initially comes across stronger in the nose. It’s balanced with fruit tones not overpowering the general structure. Definitely a winner. Also a winner was the 2009 Pinot Noir Schindler. The nose has this wonderfully unique quality that could be described as fresh morning dew crossed with watercress. The body is a touch peppery and it carries through in to the finish. Their 2009 Abondante is a great blend of Cabernet Sauvignon, Merlot, Zinfandel, and Cabernet Franc. Again, it’s a balanced wine with a great structure that would pair well with foods or be lovingly had on its own. 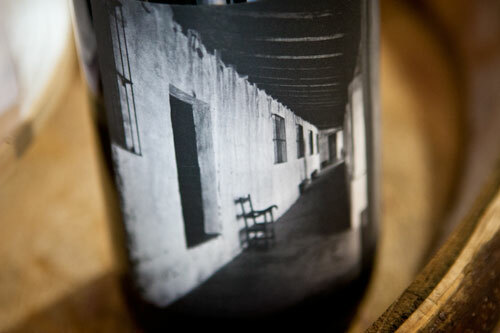 Then there’s the interesting 2010 Old Vine Zinfandel which is from that 110 year-old vineyard up in Columbia Valley. As is common in a hot weather Zin, it’s fruit-forward, but not so much that it’s annoying. In fact, it’s wonderfully refined and a very classy wine. It’s best to also mention the 2009 Merlot. It’s smoky and smooth, but still with a good degree of body that you don’t often find in Californian variants. They have a very large library of other vintages and other wines that are all made so incredibly classy by their use of glass caps instead of standard corks. Apparently they were one of the first wineries on the West Coast to make use of them (imported from Germany) and they’re a great bonus in addition to the classy labels designed by Peter’s wife, and of course, the really solid wines that are contained within. 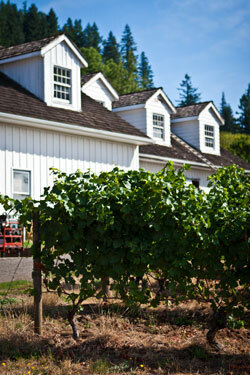 Sokol Blosser was much more of what a lot of people envision as a “proper” winery. They have a nice tasting room with a lovely porch under trees that overlook the vineyards (the grapes of which are taking forever to ripen this year up and down the valley). Given these terms and if this winery were in Napa or Sonoma Valleys, the staff would most likely be intolerable, staring down their nose at everything you say. But, this is not the case. The staff here (as well as Willamette in general) were super incredibly friendly, but not in that sleazy way. We really appreciated this and how welcoming they were despite being one of the more upscale wineries. As for the wines, they would appeal to the people who like these type of big, large-bodied, full-flavored wines. By that I mean overall they’re much more oak heavy and that’s an element we’ve definitely been drifting away from. Take for instance their 2009 Dundee Hills Pinot Noir made from organic grapes. The nose is leathery and oaky which most probably comes from aging 40% of the wine in new French oak. This could very well appeal to people who like oaky wines. For us, we would have liked a lot of that pealed away to let more of the really solid grapes come through. Then there’s the Meditrina. This is a blend of Zinfandel from Paso Robles, Syrah from Walla Wall, and Pinot Noir from Willamette. 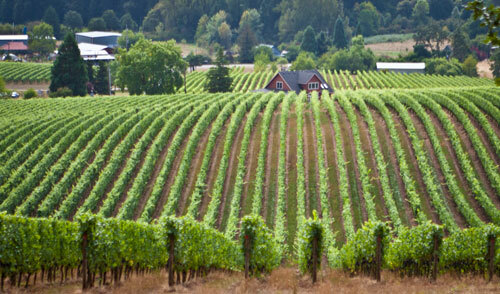 They call it a “West Coast wine” given the span of grapes from up and down the Pacific coast. These various varietals have been integrated well. It’s still dry and oaky, but it doesn’t have the intensity of the Dundee Hills and was more to our palates, which again, are not everyone else’s palates. Despite the heavy difference of styles, Sokol Blosser was a nice stop if for no reason other than contrast. Also, it’s a good place to eat lunch as they have a nice picnic area to possibly chow down on delicious sandwiches one can pick up at nearby Red Hills Market. And that’s a quick Willamette roundup. It’s always fun to explore new regions of wines that we aren’t 100% familiar with and what we tasted opened us up to some new flavors, people, and styles of wine that we don’t often encounter in California.